I had the opportunity to spend some pool time today with the Aqualung Zuma BCD. I hate to say this but I think it is a total piece of crap. I don’t even get it. Sure it’s light, but it seems like Aqualung wanted so badly to be different with this thing that they overlooked everything that’s important in a BC. First, it rides up to your ears and flops around like it’s barely attached. I have no idea why the tank band is so low, and the chest strap ends up under your chin. It’s been a lot of years since I’ve seen a piece of dive gear that I think so poorly thought out, but this is one for sure. I believe one of the key attributes of a good BC is that it fits close and doesn’t shift around on the diver both above and below the water line. From what I can tell, that’s not even possible with the Zuma because they manufactured it to fit more like a hiking pack than a BCD. I welcome conflicting opinions, but for me personally, the experience was definitely not positive. This entry was posted in New Dive Gear, SCUBA Gear Reviews and tagged aqualung, BCD, zuma. This was absolutely the worst review I have ever read. You surely can’t be serious. You tried this BC once in pool and its a “piece of crap”. First off, it sounds like the one you tested was way too big for you. Get real. I’ve used this BCD for three years as my winter travel BC and it is fabulous. My summer diving is a stainless steel backplate Halcyon cinch rig which is great for Lake Ontario and the St. Lawrence River in either a 7 mm wetsuit or a dry suit, but I’m not going to drag this set up off the Caribbean with me. That’s why I purchased the Zuma after reading that it was voted as the best travel BC by Scuba Review. Yours was the most uninformed review I’ve ever read. I should’ve replied sooner. Sorry. I stand by my opinion though. The BCD I tested fit properly. I didn’t like it, and I still don’t, because it is miserable in the water, and not very well made. What’s more, every one of my dive buddies who had one, has replaced it for the same reasons I outlined. If you like it, great. Considering that you dive a plate the rest of the time, it is surprising to me that you feel the way you do about the Zuma. But, that’s why they make lots of different gear, right? I do take issue with you calling me “uninformed,” but I guess that’s fair, since I called your BCD a piece of crap. 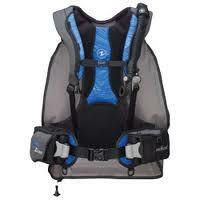 I have been looking for the lightest BCD. If not the ZUMA what would you recommend?